These unique T-shirts are 100% durable weight cotton, double stitched and very long- lasting. The prints are up to 8 color silk screen on the front and the same print in black and white on the back. 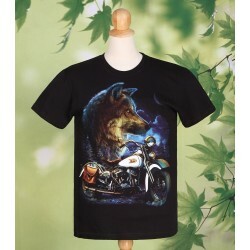 T Shirts Double Print There are 31 products. 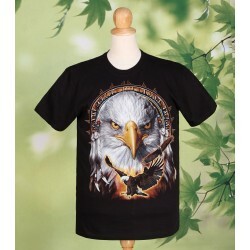 This high quality t-shirt is printed in vivid colors with a unique Alaskan Eagle design and high level of detail. The silk screen design is permanent and fully washable. This unique t-shirt is 100% durable weight cotton, double stitched and very long-lasting. The prints are up to 8 color silk screen on the front and the same print in white on the back. 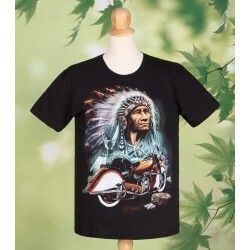 This high quality t-shirt is printed in vivid colors with a unique Chief Classic design and high level of detail. The silk screen design is permanent and fully washable. This unique t-shirt is 100% durable weight cotton, double stitched and very long-lasting. The prints are up to 8 color silk screen on the front and the same print in white on the back. 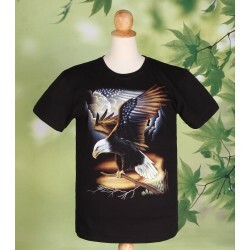 This high quality t-shirt is printed in vivid colors with a unique Defying Eagle design and high level of detail. The silk screen design is permanent and fully washable. This unique t-shirt is 100% durable weight cotton, double stitched and very long-lasting. The prints are up to 8 color silk screen on the front and the same print in white on the back. 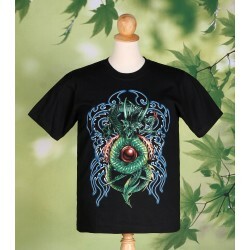 This high quality t-shirt is printed in vivid colors with a unique Dragon Eye design and high level of detail. The silk screen design is permanent and fully washable. This unique t-shirt is 100% durable weight cotton, double stitched and very long-lasting. The prints are up to 8 color silk screen on the front and the same print in white on the back. 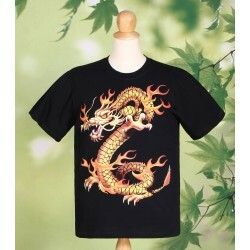 This high quality t-shirt is printed in vivid colors with a unique Dragon Fire design and high level of detail. The silk screen design is permanent and fully washable. This unique t-shirt is 100% durable weight cotton, double stitched and very long-lasting. The prints are up to 8 color silk screen on the front and the same print in white on the back. 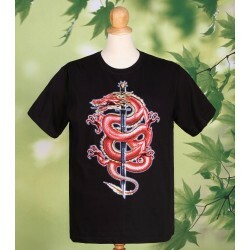 This high quality t-shirt is printed in vivid colors with a unique Dragon Sword design and high level of detail. The silk screen design is permanent and fully washable. This unique t-shirt is 100% durable weight cotton, double stitched and very long-lasting. The prints are up to 8 color silk screen on the front and the same print in white on the back. 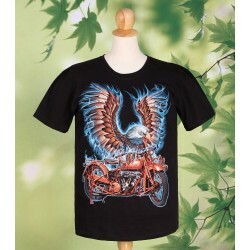 This high quality t-shirt is printed in vivid colors with a unique Eagle Classic design and high level of detail. The silk screen design is permanent and fully washable. This unique t-shirt is 100% durable weight cotton, double stitched and very long-lasting. The prints are up to 8 color silk screen on the front and the same print in white on the back. 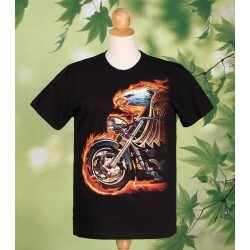 This high quality t-shirt is printed in vivid colors with a unique Eagle Rider design and high level of detail. The silk screen design is permanent and fully washable. This unique t-shirt is 100% durable weight cotton, double stitched and very long-lasting. The prints are up to 8 color silk screen on the front and the same print in white on the back. 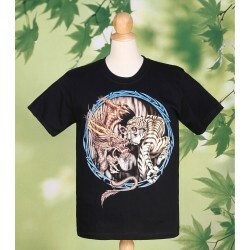 This high quality t-shirt is printed in vivid colors with a unique Evening Rider design and high level of detail. The silk screen design is permanent and fully washable. This unique t-shirt is 100% durable weight cotton, double stitched and very long-lasting. The prints are up to 8 color silk screen on the front and the same print in white on the back. 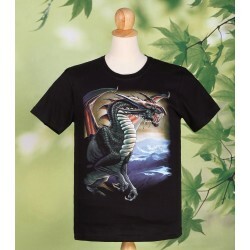 This high quality t-shirt is printed in vivid colors with a unique Flying Dragon design and high level of detail. The silk screen design is permanent and fully washable. This unique t-shirt is 100% durable weight cotton, double stitched and very long-lasting. The prints are up to 8 color silk screen on the front and the same print in white on the back. 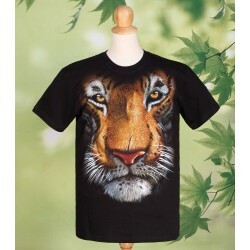 This high quality t-shirt is printed in vivid colors with a unique Gentle Tiger design and high level of detail. The silk screen design is permanent and fully washable. This unique t-shirt is 100% durable weight cotton, double stitched and very long-lasting. The prints are up to 8 color silk screen on the front and the same print in white on the back.